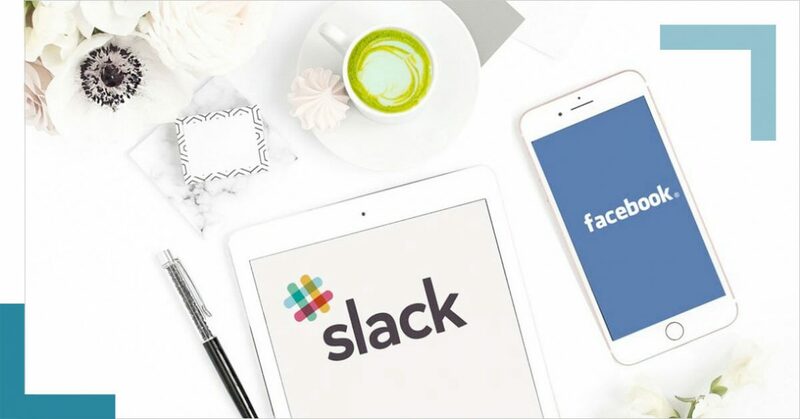 When it comes to managing online communities, what’s better: Facebook Groups or Slack Groups? Almost everyone you know is on Facebook now – to the tune of 2.07 billion people. So logic would tell you that Facebook would be the best place for your community. Well, I’m here to tell you that that might not always be true. Facebook Groups are adopted by community admins because they’re free, easy and have less friction to join because people are already on Facebook. Now, in general, I actually like Facebook Groups for FREE communities* – for the purpose of list building and engagement. But when offering a community as part of a PAID program (or if you’re collaborating with your team), then Slack has some clear advantages. When you login to Facebook, you could have dozens or 100s of notifications to read. Personally, I’ve gone into Facebook with the intention to check a specific Facebook Group and I’ve become completely distracted by my News Feed. This means I never actually make it to the community group, whether the group is free or part of a paid program. I’ve been totally derailed by cute puppies and babies! When you login to Slack, you can immediately see the unread messages and unread threads, not just highlights or posts you’ve commented on, like on Facebook. And they’re specific to that Slack Group – not about Likes on your posts or comments or that cute puppy. Since Slack is an app (both mobile- and desktop-based on most popular devices), you can have Slack open and not worry about having a browser tab open for Facebook – or having Facebook beeping at you constantly with notifications. Slack is a separate desktop and mobile app just like iTunes, Evernote, Word, Skype or email. You can also add several Slack groups that you belong to in that same Slack app (you can just toggle between groups). For example, I’m a member of probably about eight different Slack groups (courses, masterminds, teams) and I can intentionally go into each group to catch up, without being distracted. In Facebook Groups, posts get pushed to the bottom as soon as engagement on that topic dwindles. In other words, threads can disappear from your sight very quickly! And they’re not chronologically displayed, but rather popularity-based. So you really could be missing something important! Threads – On Slack, not only can you look at unread messages, you also can catch up on threaded conversations. Channels – There are separate areas called ”Channels” that can be set for different topics. For example, if you have a large group, you could have Channels for different interests or business verticals. In a community for entrepreneurs, for example, I could create a channel for each of these areas: ecommerce businesses, content creators, retailers, and services businesses – to allow for more relevant conversation and networking in each of those channels. In our agency business, we have one channel for each client, so we keep conversations organized. Direct Messages – You can send direct messages and communicate privately with other members of the community, building great 1:1 relationships. @mentions – You can send an update to everyone in the community or a specific channel by adding @channel to a message. You can also @mention people in threads to get their attention. There are literally 100’s of integrations and automations you could set up to expand the capabilities and usefulness of Slack. For example, you could tie in your project management tool, like Asana or Trello, and comment on projects without ever leaving Slack. You could also tie in your website’s live chat tool, like Drift, to give customer service to people visiting your website in real-time, right through Slack. Or you could hook up Stripe to notify you when there’s been a customer payment. Or share content — upload documents and pictures or videos from YouTube/Vimeo and have them play natively in Slack, without having to go to another site. Even though the time it takes to setup or join a Facebook Group is virtually instantaneous, you’ve probably searched for something in a Facebook Group and came up short – and ended up super frustrated. And that search can take up tons of your precious time. The search feature is so much better on Slack than on Facebook so it can actually save you time. Plus, there’s not really a whole lot of time pressure for members to set up Slack for the first time. It takes only a few minutes to download the app. When you factor in searching time, Slack is actually less time consuming to use because you don’t have to scroll and scroll, searching through old conversation threads to find information, like you would with Facebook. I don’t necessarily think Facebook is better than Slack, overall. It’s only that one tool is better for different reasons. *NOTE: Keep in mind that it’s against Facebook’s policy to charge for access to a Facebook Group. That’s why a lot of people will offer a paid program with the Facebook community as a free bonus. You would be in violation of Facebook’s policy if you literally charged something, even $5/month to access a private Facebook Group. Facebook Groups are great for growing your list, and engaging with prospects, so it’s great for FREE communities. But when it comes to the best tool for communicating with paying clients, customers, and students (as well as teams), Slack is the clear winner.